Scantron’s Women’s Network recently conducted a successful clothing drive to support Dress for Success Dallas. Scantron offices collected 200 pounds of clothing and $220 in individual donations. Scantron also contributed $2500 from the overall organization. The mission of Dress for Success is to empower women to achieve economic independence by providing a network of support, professional attire and the development tools to help women thrive in work and in life. The organization has changed over 2100 women’s lives in the last 12 months in the Dallas area alone. Scantron conducted its recent National Sales Meeting in Dallas. 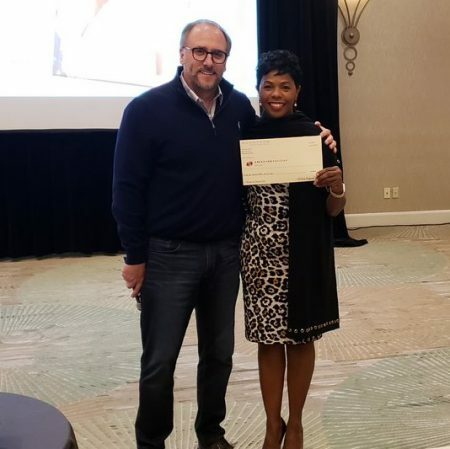 Dress for Success Dallas board chairperson, Dr. Lauren Freeman, spoke at the Scantron meeting and accepted the clothing donations and a check from Kevin Brueggeman, Scantron CEO.